Don't be a space case; get your hands on the Looney Tunes Marvin the Martian Give Me Space Heather Royal Blue T-Shirt! A vintage-style distressed print on the front of this durable blue tee reads "Give me some space!" next to an angry Marvin the Martian. 60% Cotton, 40% Polyester. 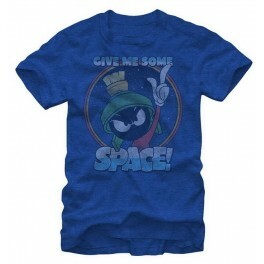 Don't be a space case; get your hands on the Looney Tunes Marvin the Martian Give Me Space Heather Royal Blue T-Shirt! A vintage-style distressed print on the front of this durable blue tee reads "Give me some space!" next to an angry Marvin the Martian. 60% Cotton, 40% Polyester. Please refer to our size chart below for shirt dimensions.